Put on the undergarments. 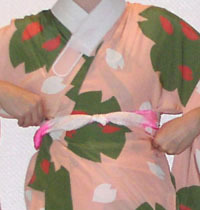 Thread the juban's koshihimo through a loop in the chikara nuno, with one end shorter (enough to reach around your front). 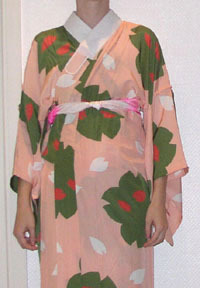 In the photo at left, the koshihimo is threaded through the middle loop. Take the ends of the collar in your hands and pull forward enough so that there is as little excess fabric in back as possible. Check that the back of the collar is off the nape of your neck, then cross the front panels left over right. After straightening the collar and making sure it stands up correctly, wrap the long end of the koshihimo around your chest twice, then tie. It should be quite high. 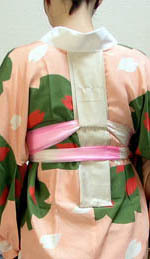 The middle loop usually gives a proper collar curve, although the amount of nape that shows with each loop will be different for others, as it depends on your height, the distance between the bottom of your neck and your chest, and how high or low you tie the koshihimo. The top loop will give a very deep curve, good for wearing bridal kimono, whereas the bottom loop will produce a shallow curve, more proper for young women. A front view - with this photo you can better see how high up the koshihimo should be in front. To remove wrinkles, pull any excess fabric to the sides so that it is gathered beneath your armpits. Do a final collar check: if it's too high up in the back, pull on the chikara nuno until you get the curve desired. The V formed by the collar in front should be high enough to cover the indentation in your throat.